The Federal Aviation Administration has ordered a stop to all “doors-off” helicopter tours nationwide following the crash that killed five people last Sunday in New York City. ﻿Helicopter operators, pilots & consumers should be aware of the hazard from supplemental restraint devices during an emergency evacuation during “doors off” flights. The FAA will order operators & pilots to take immediate action to control/mitigate this risk. Until then, the FAA will order no more “doors off” operations that involve restraints that cannot be released quickly in an emergency. Additionally, the FAA will conduct a top to bottom review of its rules governing these flights to examine any potential misapplication that could create safety gaps for passengers. These “doors-off” flights have grown in popularity for tourists and professionals seeking to take unobstructed photos of the scenes below. The Sunday crash involved a helicopter with no doors, and the passengers had to be strapped into their seats with harnesses that also attached to the floor, the New York Times reports. The pilot of the crashed helicopter, the only survivor, claimed it was possible the helicopter’s fuel shut-off switch may have inadvertently been hit by a passenger’s strap. 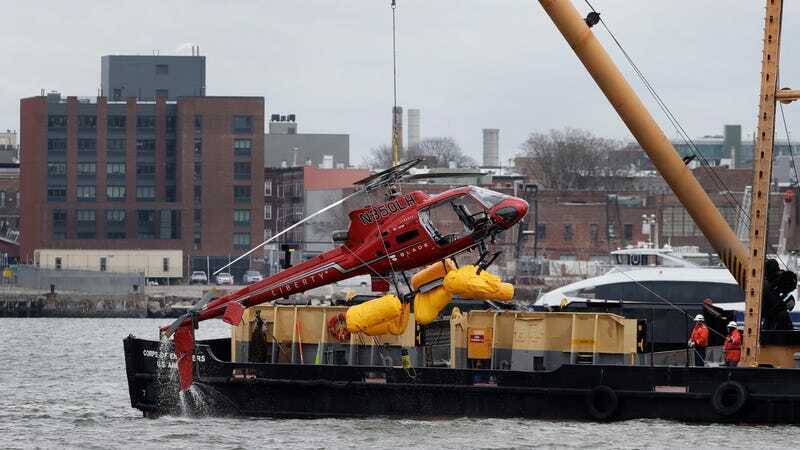 The passengers are said to have survived the initial impact, but drowned as they struggled to escape their restraints as the helicopter overturned in the water and flowed downstream in the East River. The passengers were shown a short safety video which demonstrated use of a knife to escape the restraints in the event of a crash. It’s not regulated and it should not be allowed...It’s like allowing someone to walk on the wing of an airplane, and in my judgment poses too much of a risk. We’ll have to wait and see what sorts of new rules the F.A.A.’s “top to bottom review” yields.